Hurricane Michael made landfall at the Florida panhandle as a Category 4 hurricane Wednesday with 155 mph winds, quickly destroying demand for power, natural gas and refined oil products. Shut-in oil production rose modestly from Tuesday to over 700,000 b/d, but the storm has stayed east of much of the region's production, which means supply should be back online quickly. Meanwhile, the severity of the storm has surprised to the upside, which could a mean longer lasting and more severe impact on demand for power, natural gas, refined products and ultimately crude oil. "We expect the impact on refined products demand to be below that of previous hurricanes in the Gulf Coast such as Harvey in 2017, as the region impacted by Michael has lower population density than Houston ... Nevertheless, the impacts are favoring the high side of our estimates given the sheer severity of the storm," said Claudio Giamberti, Head of Demand and Refining at S&P Global Platts Analytics. As of 7 pm EDT, the eye of Michael was moving over southwestern Georgia with maximum sustained winds still at 100 mph, according to the National Hurricane Center. The storm is expected to move northeast across the Carolinas before heading back out to sea Friday morning. *As of 11:30 am EDT Wednesday, 718,877 b/d of all production had been shut in, according to the Bureau of Safety and Environmental Enforcement, representing 42.3% of total Gulf of Mexico production. *After more than doubling from Monday to Tuesday, shut-in production was up just 7% from Tuesday to Wednesday. *Assuming most fields resume production by the end of the week, the cumulative lost oil production for the month of October will be 90,000-100,000 b/d, according to Platts Analytics. *The demand impact for products is expected to be 30,000-50,000 b/d for gasoline, 10,000-15,000 b/d for distillate and 10,000-20,000 b/d for jet fuel for the next five weeks. Those impacts are favoring the high side of estimates given the intensity of the storm so far. *The US Coast Guard declared port status Yankee for the port of Savannah, Georgia and the port of Charleston, South Carolina, preventing ships from entering the ports, and requiring ships seeking to depart to "arrange immediate departure." The USCG declared X-Ray for Wilmington, North Carolina, keeping the port open, but requiring departing vessels to "do so within 12 hours of gale-force winds." The three ports are key regional bunkering centers. *The port of Panama City, Florida, where Chevron has a petroleum products terminal, and the port of Pensacola are closed. *NYMEX November WTI slid $1.79 to $73.17/b as little additional production was shut in and amid a selloff in US equities. *Concerns about hurricane-related demand destruction contributed to a drop in products futures Wednesday. NYMEX November ULSD settled 2.89 cents lower at $2.3949/gal and NYMEX November RBOB fell 2.89 cents to $2.0204/gal. *Personnel have been evacuated from 89 production platforms, 13% of the 687 manned platforms operating in the Gulf of Mexico. *Personnel have been evacuated from three non-dynamically positioned rigs, 13% of the 22 operating in the Gulf of Mexico. *Four dynamically positioned rigs have moved out of the storm's path as a precaution. **Colonial's two main pipelines -- the 1.37 million b/d gasoline line and the 1.16 million b/d distillate line -- were "not in the line of the storm," Colonial said in a statement Wednesday. *Kinder Morgan is monitoring Hurricane Michael and its impacts on its 700,000 b/d Plantation Pipe Line system, which carries refined products from Baton Rouge, Louisiana, to just outside of Washington, DC. Kinder Morgan shut its Albany, Georgia, terminal ahead of the storm's arrival. The terminal, located just north of the Georgia-Florida border, has 93,000 barrels of storage and receives gasoline and ULSD from the Colonial Pipeline. *The company's 93,000-barrel petroleum products storage terminal in Albany, Georgia, was shut down in advance of the storm, but is expected to return to normal operations Thursday. *As of 11:30 am Wednesday, 812 MMcf/d of natural gas production had been shut in, representing 31.7% of total Gulf of Mexico production, according to BSEE. *After rising more than 150% from Monday to Tuesday, shut-in production was up only 12% from Tuesday to Wednesday. *Natural gas demand in the storm-affected region should fall Thursday because of power outages and lower temperatures, according to Platts Analytics. *The benchmark Henry Hub held onto gains from Tuesday and set another high watermark for the shoulder season rising .5 cents to $3.37/MMBtu. *Meanwhile, prices closer to the storm path continued to show the impact of expected demand destruction with Transco Zone 3 and Zone 4 falling a few cents to $3.28/MMBtu and $3.325/MMbtu, respectively. *Kinder Morgan will suspend construction activities at its Elba Liquefaction Project at the site of its existing LNG terminal at Elba Island, Georgia, on Thursday, but expects to resume construction after the storm passes, the company said in a statement Wednesday. 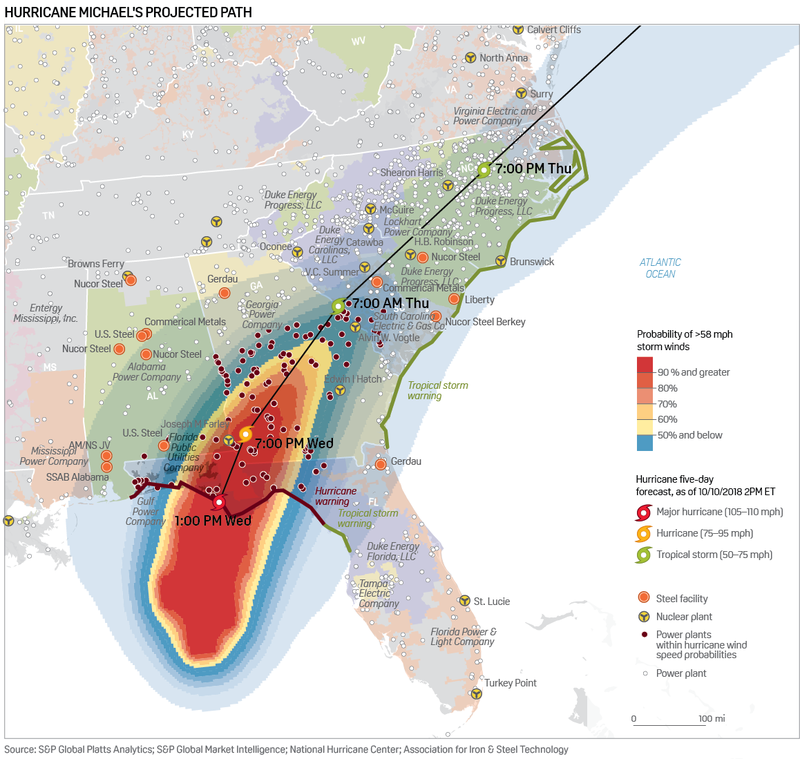 *S&P Global Platts Analytics has estimated, based on the experience with 2016's Hurricane Irma, that average load in the Southeast would drop by a range of 20% to 30% because of Michael's arrival. *Peak demand for the Southern Company balancing area, which includes Alabama Power, Georgia Power and Gulf Power, reached 31,219 MW around 5 pm Wednesday, compared with 35,467 MW last Wednesday, according to the Energy Information Administration. *For the Florida region, the EIA reported actual demand peaking at 38,177 MW at 4 pm Wednesday, compared with an actual peak of 40,934 MW last Wednesday. *Despite the drop in load, there was little change in bilateral power prices in the region. *Into Southern next-day on-peak power was trading in the mid-$30s/MWh, down about $1.25 from Tuesday's assessment. *Into Georgia Transmission Corporation was up slightly in the low $40s/MWh. Total reported outages across the impacted area were 207,000. *In a precautionary move, Southern Nuclear, which operates the 1,776-MW Farley nuclear plant in Columbia, Alabama, reduced output from the facility, which is located about 100 miles north of Panama City Beach, Florida. US nuclear plants are required to shut-in advance of the arrival at facilities of hurricane-force winds. *Port and metals-production operations in Alabama could be affected, but for now the storm is east of the major metallurgical coal port of Mobile. *Metallurgical coal prices were unaffected by the storm with the Platts US high-vol A met coal index stable at $207/mt FOB USEC. *13 steel mills are in the path of Hurricane Michael, totaling about 16 million st/year of raw steelmaking capacity, or approximately 13% of total steel capacity in the US. *A survey of several mills Wednesday showed little concern about any major impact. No disruptions reported at steel plants from Jacksonville, Florida, to Calvert, Alabama. *Century's wholly owned Mt Holly aluminum smelter in South Carolina, with a production capacity of about 231,000 mt/year, representing about 8% of total US primary aluminum capacity, could be affected by the storm. *JW Aluminum's sheet mill in Goose Creek, South Carolina, and Bonnell Aluminum's extrusion facility/cast house in Newnan, Georgia, could also be impacted by Michael.